The UEFA Champions League (UCL) is one of the most prestigious football tournaments in the world. Each year, people around the world enjoy watching the matches. 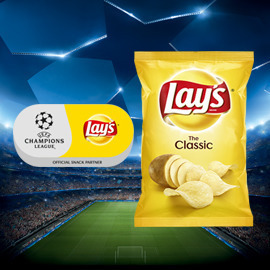 As the official sponsor of UCL, Lay’s wants its chips to accompany people watching the championship and having quintessential fun times together. Its crisps range is full of flavors that are the perfect choice for these moments. Lay’s would like to make the sponsorship visible and tangible to as many people as possible – and not only football fans. Can you help? In a presentation with visuals and text, imagine how Lay’s can leverage the UCL sponsorship and make it exciting for everyone.